If I have to pick one national park in Western Australia with the best beaches from those that we’ve visited, then I would not hesitate before saying: Cape Le Grand National Park near Esperance. This park is one of Western Australias best known and most spectacular National Parks with its extremely beautiful beaches, orange-colored granite rocks next to the sea and a bird view from the Frenchman Peak! As you remember, this morning we spent at the Great Ocean Drive near Esperance. After that we went to the WA Parks and WildLife office to buy a pass for the Western Australian parks and get an advice where to camp at Cape Le Grand National Park. A nice lady at the reception advised us to stay at Le Grand Beach Campsite. She said that this area becomes very busy during the summer, but we were there in late August, so it would be quet. She was right: we had all the campsite for ourselfes and it was one of the best campsites we’ve ever stayed! If you are not a big fan of camping, the Cape Le Grand National Park is located 50 km south-east of Esperance, so you can stay in the town and go there for a day trip. After we arrived at the Le Grand Beach Campsite, paid camping fee to the ranger and set up the tent, we went to the Thistle Cove first. Absolutely amazing place with huge rocks to walk and explore! Lucky Bay was the next one. This beach was voted the whitest beach in Australia through a sand sample comparison conducted by a committee that represents all States and the Commonwealth in soil matters (Esperance Media statement). Of course other states will not leave this unchallenged. NSW claims that Jervis Bay has the whitest beach in the world and we can be sure Queensland has a couple of their own candidates. But no matter, it is enough for us to know that Lucky Bay is beautiful, with dazzling white sand and clear turquoise water. Absolutely fantastic place! 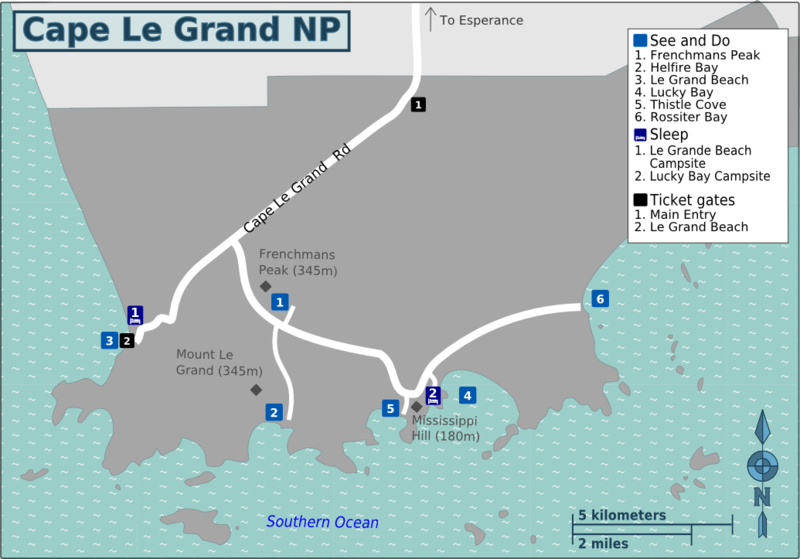 There are two main walks in Cape Le Grand National Park. One is the Frenchman Peak climb (3km return), and the other one is the Coastal Track (15km one way). If we had another day, we would walk both of them, but it our case we had to choose and Frenchman Peak climb was the winner. As I said, the slope is not too steep, but you have to follow the poles with white marks and be VERY careful (especially if you travel with young kids). The views from the top are stunning! The sunset on that day was beautiful as well. Perfect ending of the perfect day. At the end of our visit we went to Helfire Bay to get this 'postcard' view and then went further, to Albany. It feels a bit unreal for one park to have so many fantastic beaches. Photographs don't really do them justice and they have to be seen to be believed. Forget about the Carabbian, Maldives or whatever else. This is Australia at its very best when it comes to coastline. Highly recommended to all ages.